Gathering at the crossroads of ancient faith and contemporary culture, we are a Christian church asking God to open us to a new way. WORSHIP is the cornerstone of our lives together. WHEN WE GATHER FOR WORSHIP, we gather to renew our relationship with God. We open ourselves by praying singing, listening, and being together. We gather to hear good news proclaimed in word, music, and silence, to share the experience of a time and space set aside, to reach out and to be reached. We gather to offer thanks to God and to ask for God’s help. AT EDWARDS CHURCH, we hope that every time you participate in worship, you will experience the holy. It could be in the smile of a new friend or the embrace of an old one. 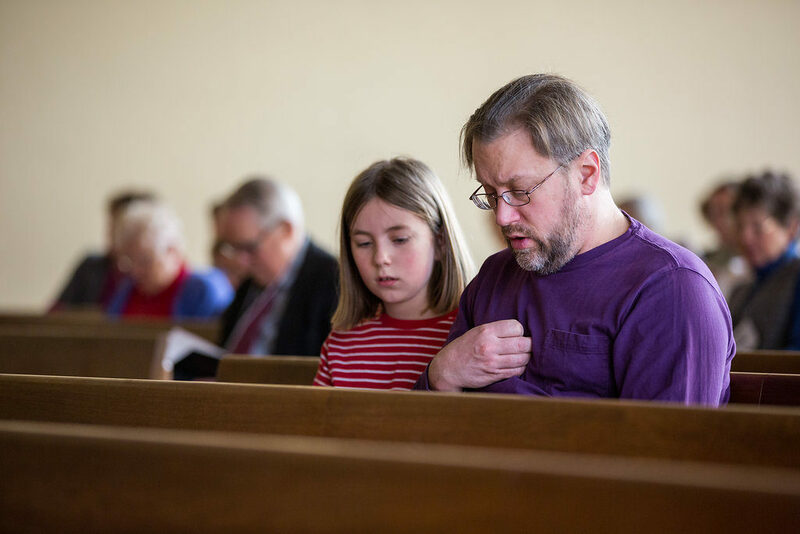 It could be in soaring organ music or a quiet prayer, in scripture that comes alive in reading and preaching, or in the way the feeling of the room changes over the course of an hour. WE WORSHIP ON SUNDAYS AT 10 AM and at other times for special services. Welcome: “No matter who you are or where you find yourself on your spiritual journey, you are welcome here, today and every other day.” We also share brief community announcements. Transition to focus on God’s presence, using music and prayers. Children and the young at heart come forward to the front of the sanctuary to discuss a topic connected to the theme of the day and then depart for church school. A lay leader reads scripture. 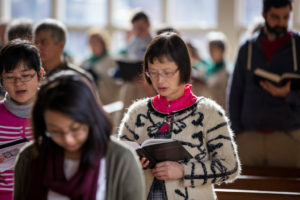 Sermons in our church emphasize connecting scripture to everyday life. That connection may be comforting or challenging, or a little of both. The sermon might refer to a popular movie or a story in the news, a poem or a well known novel. Anything is fair game to “crack open the word.” Our aim is always to learn how scripture can resonate in our lives. We sing a second hymn and pray for each other and the world. Then we make an offering of financial gifts. Although financial contributions are welcome and encouraged, they are not required. On the first Sunday of the month, we celebrate Communion. On those Sundays, worship is inter-generational from beginning to end, though childcare is available for very young children under 7. We then sing a closing hymn, the preacher offers a benediction, and our minister of music finishes the service with an organ postlude. Worship is followed by refreshments and community gathering in Addis Hall, which is directly under the sanctuary.